Karl Marx-Hof is one of the best-known Gemeindebauten (German: municipal tenement complexes) in Vienna, situated in Heiligenstadt, a neighbourhood of the 19th district of Vienna, Döbling. Karl Marx-Hof is built on land that, until the 12th century, had been under the waters of the Danube, deep enough for ships to travel over the area. By 1750, all that remained was a pool of water, which was drained by Holy Roman Emperor Joseph II. Gardens were then built in the area, but these were removed by the Vienna city council, then controlled by the Socialist Party of Austria, to make room for the erection of Karl Marx-Hof, financed by a special tax named after councilor Hugo Breitner, commissioning locally and internationally renowned architects. 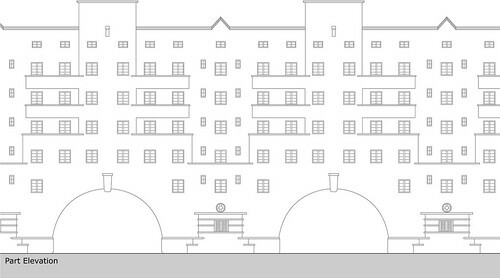 Karl Marx-Hof was built between 1927 and 1930 by city planner Karl Ehn, a follower of Otto Wagner. It held 1,382 apartments (with a size of 30-60 m² each) and was called the Ringstraße des Proletariats, or the Ring Street of the Proletariat. Only 18.5% of the 1,000 metres long, 156,000-m² large area was built up, with the rest of the area developed into play areas and gardens. Designed for a population of about 5,000, the premises include many amenities, including laundromats, baths, kindergartens, a library, doctor offices, and business offices. The heavy artillery damage to Karl-Marx-Hof was repaired in the 1950s. The building was refurbished between 1989 and 1992. At over one kilometre in length (1100m, 0.68 mile) and spanning four Straßenbahn (tram) stops, Karl Marx-Hof holds the distinction of being the longest single residential building in the world. During the period immediately after the first world war the city of Vienna constructed more than 60,000 new dwellings in a little over a decade. Rather than following the modernist trend of schemes based in Germany and the Netherlands, the Viennese authorities opted for a denser more urban form of closed blocks surrounding interior courtyards. This was known as the ‘hof’ and became identified with the social programme and the new modern style. 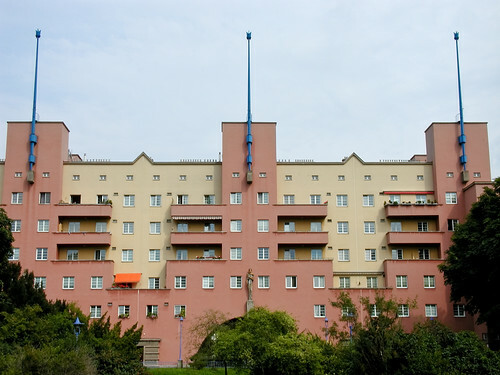 The Karl Marx Hof is the largest example of this model, designed by Karl Ehn, and has come to represent the socialist housing programme of ‘Red Vienna’. 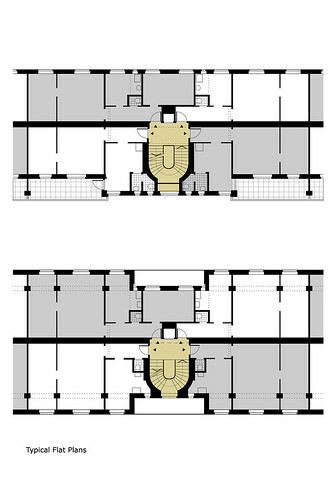 The rectilinear blocks are generally 4 storeys high and 11m deep, staggered to follow the street front and enclose the courtyards accessed through the large archways cut through the perimeter wall. The image most associated with this project is that of the centrally located seven storey block with a series of towers leading onto balconies.